Open every day except December 25. Waterproof membranes encase the chamber to prevent the infiltration of water from an accidental leak. A dedicated heating, ventilation, and air-conditioning system provides filtered air and controlled humidity and temperature. A special fire-prevention system prohibits combustion by reducing the concentration of oxygen in the air in the chamber. Extremely low light levels in the chamber and the surrounding viewing area minimize light damage. The exhibition surrounding this chamber tells the dramatic story of the flag and traces its journey from Mary Pickersgill’s house to the Smithsonian. The exhibition makes use of lighting, ambient sound, video, and an interactive table with a virtual, life-size image of the flag to enhance and complement the visitor’s encounter with the real artifact. 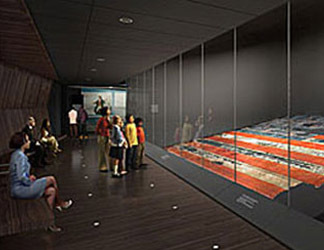 A tactile panel with an outline of the flag and a full-sized star offers access to the main experience of the exhibition—viewing the Star-Spangled Banner—for vision impaired and blind visitors; prerecorded audiodescription tours are also available. Together, these exhibition elements provide visitors with a new way to experience the Star-Spangled Banner, learn its history, and appreciate its significance. Visitors are seen in the newly re-opened exhibition at the National Museum of American History.